This week is very special, as it’s our 100th Challenge!! Woot! Thanks for being with us, for playing along, and sharing your creativity with us. The colours in the challenge do not have to be used in your project – you get to choose the colours, layout and stamp sets to use. I started with a panel of Whisper White cardstock, and used the ‘waves’ image stamp from the High Tide stamp set to create the wispy clouds background, stamping in Soft Sky ink. Next, I stamped the 2 clouds from the Lift Me Up stamp set onto Whisper White using Pool Party ink. The balloons were stamped onto Calypso Coral cardstock in Smoky Slate ink, and on Peekaboo Peach cardstock in Peekaboo Peach ink. I used my Big Shot with the Up & Away Thinlits Dies to die cut the balloons and clouds. Next, I stamped the banner outline using the Banners for Christmas set, stamping in Dapper Denim ink. The sentiment is from the Lift Me Up stamp set; I actually cut the sentiment stamp into 2 parts, so that I the would fit on the banners, without tricky masking. I stamped them in Calypso Coral ink, then used the Bunch of Banners Framelits and Big Shot to die cut it. I attached all of the pieces using Stampin’ Dimensionals, then glued the panel onto a panel of Calypso Coral cardstock, then finally to a card base of Dapper Denim cardstock. 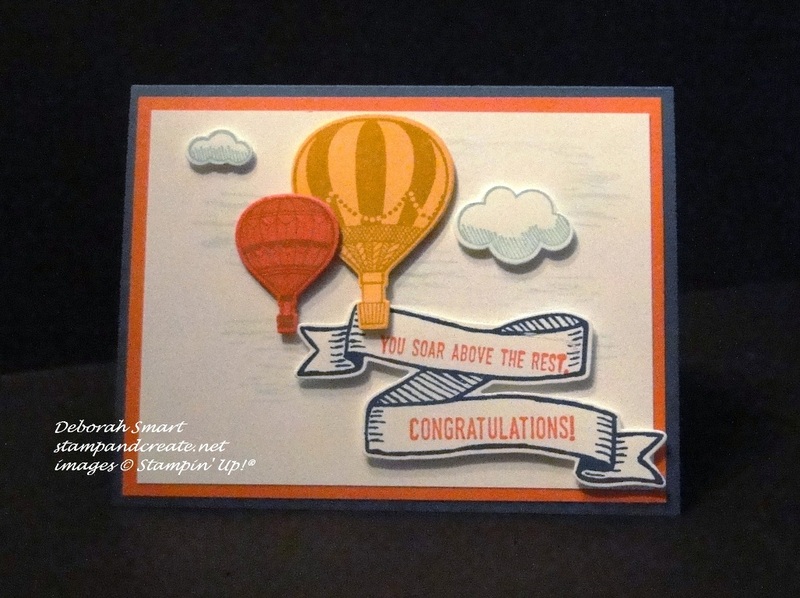 This card came together fairly quickly, and was fun to put together, to create the floating scene of hot air balloons and the banner. I’d love to read any comments you’d care to leave – let me know what you think! As I mentioned, this is the 100th challenge for the Watercooler Wednesday Challenges. It’s also my last challenge with them as part of the Watercooler Artists, as I’ve decided to step away from doing this on a weekly basis. It was a tough decision, because this a group of wonderful people, and I love seeing you cards each week! However, I’m focusing more of my time on the ‘online’ aspect of my business, and learning how to record, edit & post videos to share with you, and offering ‘classes in the mail’ for those who aren’t able to attend my local classes. So – please continue to take part in the Watercooler Wednesday challenges! I will still be taking part in the Wacky Watercooler Blog Hops (there’s 2 coming up this month – I’ll be in the 2nd one). Now – head over to the Watercooler Wednesday blog page, check out what the design team have created for you, then link up for the challenge. Remember – holidays are over, so it’s back to a 1 week challenge this week. Next Next post: BUNDLE UP! Aww, thanks Susan! 🙂 So glad you liked my card! Deborah I’m so happy that you stayed with us for this “100th” Challenge. Your card was so “uplifting” and made me totally smile. It’s also one of those enablers where I have to get off the fence and get this set. Thanks….. On a sad note I’m totally going to miss your great designs and all the valuable information you always impart with your beautiful projects, but well understand the need to open another door. Hugs to you! Thank you for such a lovely comment, Penny! It has been wonderful being part of this group, and I know it will continue for at least another 100 challenges! You always inspire me with your creations, Penny; I’m looking forward to following them still.